As with most thickly cut Kettle Chips, these featured a robust and firm crunch that did not melt away to mush as can often be found with regular Chips. The seasoning may have damped it all down a bit, and there was not a significant amount of sharp edges, but the crunch still sustained to the Chip's demise. These Chips were thick and firm. The Kettle Cooked nature meant that there were lots of odd shaped Chips, but not so many dramatically bent or doubled over Chips. Although there was a darkish yellow color, there was also plenty of seasoning to disrupt the surface. There were also some little green flecks here and there. Frito-Lay generally like their Chips to be pleasing to as many people as possible, so even though these had the word 'Jalapeno' writ large across the center of the bag, we did not expect too much. A Nose Plunge Test did reveal a rather impressive peppery Jalapeno aroma. 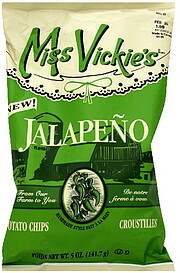 The taste was a little creamy and greasy potato mixed with particularly spicy Jalapeno. Actually scrub that, just Jalapeno. The pepper was noticeable in its flavor description, and although not blisteringly hot, it did not need to be in this case. For a mass manufactured 'Hot' flavor, this was pretty impressive.